Please join us on Thursday, April 11 from 5:30-7:30 to celebrate with us! All are welcome! Feel free to park at LaPerche or next door at Ocean State Baptist Church. If you have folks with you who might need to park close to the doors, feel free to park at LaPerche. Otherwise, we ask that you park at the church and walk across the grass. Thank you! Doors #1, #3 and #9 will be unlocked. Please enter through any of them. The event will kick off in the cafeteria at 5:30pm. Our fourth grade will be performing during the opening remarks. Please see below for the variety of events taking place around the building. Please visit as many as you can as the students are excited to showcase their learning! Our building is a square and each hallway is a different color. Use the color guide below to find your way around! Start anywhere on the list below and continue on in order and you will visit everything! Or jump around and visit in any order. Would you like a tour of the building? When you arrive you will be greeted by a LaPerche student who can set you up for a tour. Any questions? Feel free to email Julie Dorsey, LaPerche principal, at jdorsey@smithfield-ps.org or Sandra Bazinet, school secretary, at sbazinet@smithfield-ps.org. What will you do/see/experience there? The event will kick off in the cafeteria at 5:30! Then, put on your dancing shoes and join Miss Caroline from Reverb Performing Arts Center in Smithfield as she teaches dances through the decades. Cupcake Truck--Visit the amazing cupcake truck to enjoy a decision anniversary cupcake. You can access the truck through door #6 in the cafeteria. Cupcakes are $3 each. First come first served until there are no more! Guests will look through photographs and read about how the LaPerche neighborhood has changed over the past 50 plus years. Our focus is the Y that Limerock Rd and Harris Rd create and how the area has changed. 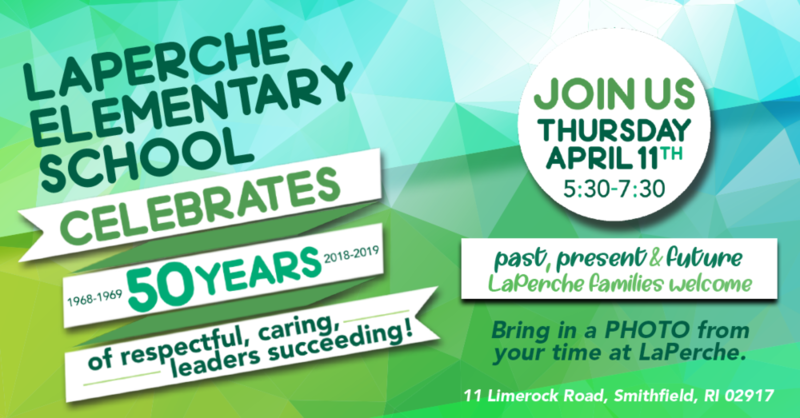 Visitors will be able to learn about the lives of LaPerche alumni. Our fourth grade students recently interviewed LaPerche alumni and the interview photos and transcripts can be found here! Specifically, guests will learn about their early life experiences, their time spent while at LaPerche, along with what they are currently doing by reading interview transcripts. Team up with a partner (one adult and one child) and sign up for a pickleball or beach ball volleyball game in the gym. Games will rotate every 15 minutes. Sign up outside the gym in the green hallway. Get ready to be named Pickleball/ Beach ball Volleyball Champion! Remember when platform shoes were in style?! Travel back through the last 50 years of fashion trends! Visitors will be able to look at photographs and read informative paragraphs that will bring back memories of past fashion styles! Book Fair Time!! Visit the library to check out our Buy One-Get One Scholastic Book Fair! Stock up on books for summer reading! Families will take a nostalgic trip back in time 50 years ago to see what life was like back then. Read to find out whether students would prefer to have lived back then or now. The results might surprise you!! Some of the great classic children’s books come from the same time period that LaPerche first opened. Did you know that “The Very Hungry Caterpillar” is also turning 50? Families will take a look at storybook characters from the 60’s and 70s and read to find out students’ opinions about their favorites. Some you may even recognize from your childhood. Kindergarten friends enjoyed the story, Rosie’s Walk, written by Pat Hutchins in 1968. Students then created their own stories by changing the character and setting and using prepositions. Join us to view the students stories. Gather your crew together and head to the area outside the staff lunchroom for a group photo opportunity! Students went around the school asking teachers the question, "How long have you been teaching at LaPerche?" We then took our data and graphed our results. We compared grade level teachers to see what teacher from each grade has been teaching at LaPerche the longest. Families can take a guess who has been teaching at LaPerche the longest based on each grade level and take a look at the graphs students made showing the data.